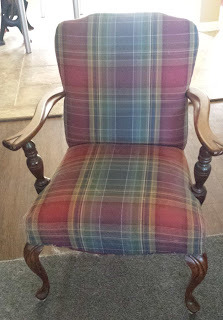 This chair belonged to my maternal grandmother who I called Mama. I got this chair from her so many years ago I don't want to think about it...over 30 years ago. 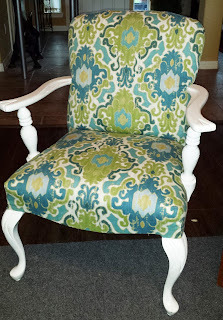 This is the 3rd time I've recovered the chair but this time I did it myself instead of having it done professionally. I also took the time and sanded down the wood frame and painted it; first coat was Kilz primer paint and then I used a semi-gloss white latex and mixed in some Floetrol for the next couple of coats. Floetrol is a liquid that is mixed with paint so you can't see the brush stokes and leaves you with a smoother finish. While the material isn't as smooth as an upholstery professional would have done, I still love the way it turned out and was much cheaper.